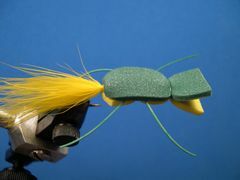 The Hot Lips popper is made from two strips of soft foam along with two sets of rubber legs and a marabou tail. 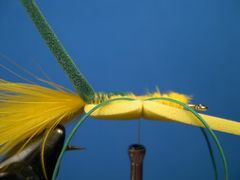 Here is how I tie this fly created by Curt Nordrum and recommeded by expert smallmouth angler Tim Holshlag as one of his Top 40 flies. 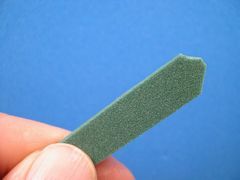 The overall length of this foam popper is about two and one-half inches. Tie this fly in any color combination that works for you. The Hot Lips illustrated in Holshlag's "Smallmouth Flyfishing" appears to have a yellow back, black belly, white tail, and yellow legs. I use foam strips that are 3/8 inch wide and that seems to work for me. Tim Holshlag says the fly is pretty good in both rivers and lakes. He especially likes to fish it in the evening on relatively clear rivers and streams. Fish the fly like you would fish other poppers and hairbugs. On lakes, let it drop and settle before you employ a strip - pause - strip retrieve. On streams, cast it to holding water and strip it back with short strips. 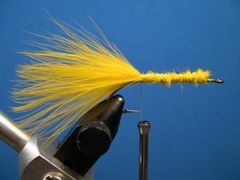 Attach the fly to your leader with a loop knot to allow the fly to move more freely. 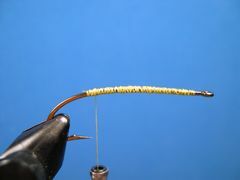 If you are not familiar with loop knots click on "Tying Warmwater Knots." Start the thread an eye width behind the eye and cover the shank with close tight wraps of thread back to the hook's barb. 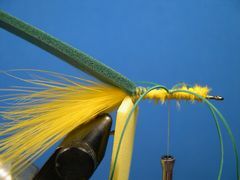 Tie in the marabou for the tail. The tail should be the length of the hook's shank. 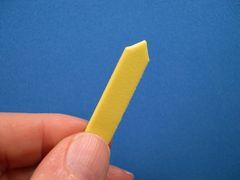 Cut a piece of yellow fly foam for the belly that is 3/8" wide and make a tip for the tie-in point. 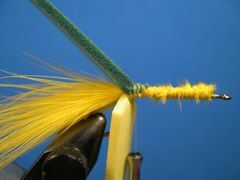 Tie in the foam by the tip on the bottom of the hook's shank so that the tying thread ends up at the hook's point. This step is easier if you have a rotary vice so you can turn the hook upside down as shown in the photo. Repeat the same procedure that you did in Step 3 with a piece of green foam for the back. 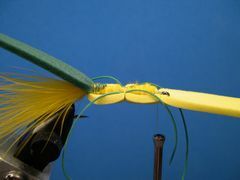 Tie in the green foam strip for the back on top of the hook's shank so that the tying thread ends up at the hook's point just as you did with the yellow foam strip for the belly. 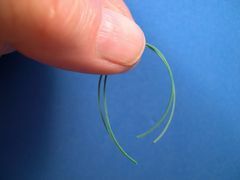 Prepare two strips or rubber for the legs that are about three-inches long. Advance the thread to the center of the hook's shank and bind down one strand of rubber on the far side and one strand of rubber on the near side of the hook. Pull the belly foam forward and bind it down with two or three wraps of thread where the thread is hanging. The thread wraps should be made between the legs. Pull the yellow strip back with your left hand and spiral the thread forward as shown with your right hand. 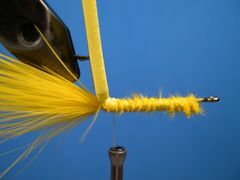 Now pull the yellow strip forward and bind down the yellow foam strip with two or three tight wraps of thread. 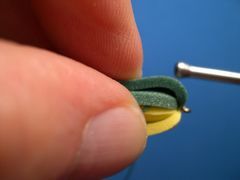 Now pull the green foam strip forward and bind it down with two or three tight wraps of thread. 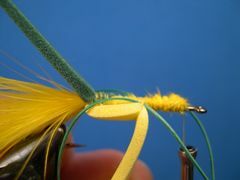 Move both the yellow and green strips out of the way and take several tight wraps of thread behind the hook's eye. Tie off the thread with two half-hitches or a whip finish and clip the thread. Trim the foam to make the lips and the legs to a length to suit you. 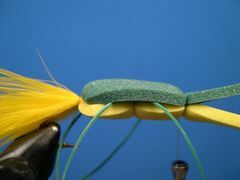 The foam lips on my flies are a little more than a quarter of an inch long and the legs are slightly more than an inch long. Your Hot Lips popper is finished.